Earning a master’s degree is a huge accomplishment and can open up new opportunities for your career. Most master’s degree programs require 1.5 to 2 years of study, but you may take longer if you’re also working. 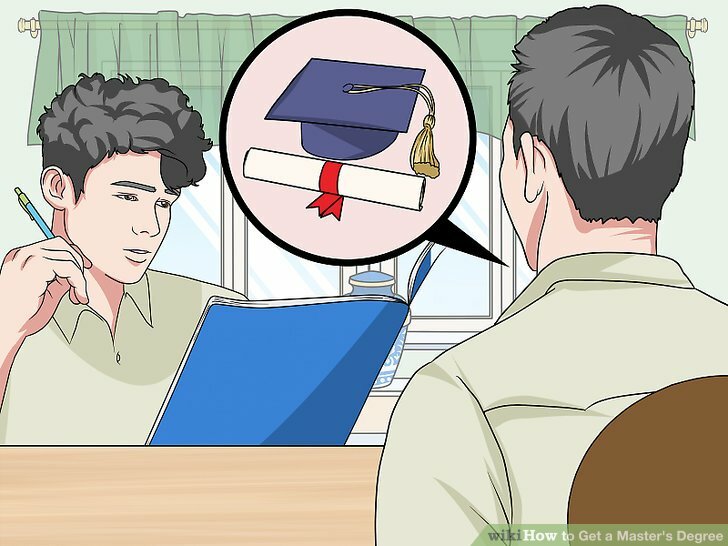 Before you can earn a master’s degree, you need to choose a program, submit your application, and decide how to pay for it. Then, you can complete your coursework to succeed academically. 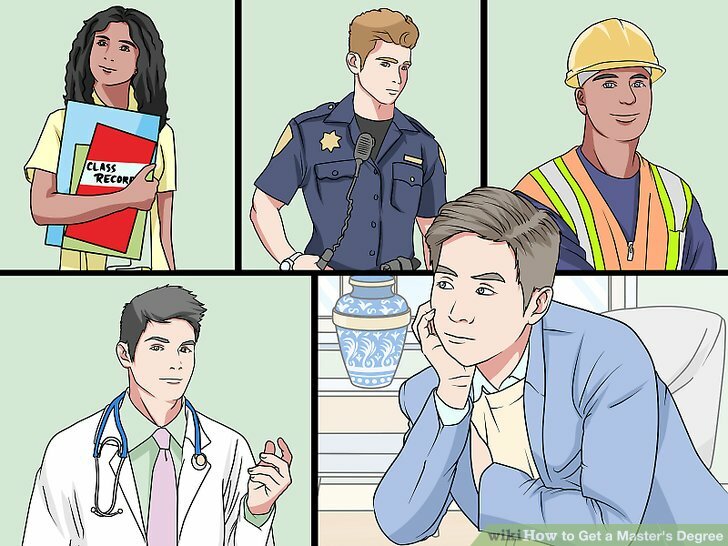 Map out your career goals. The program you choose should match your career path and provide opportunities for employment in the location you want to work. Otherwise, your new degree may not pay off like you’d like. Once you know the job you want, you can research the type of master’s degree that best fits your goals. 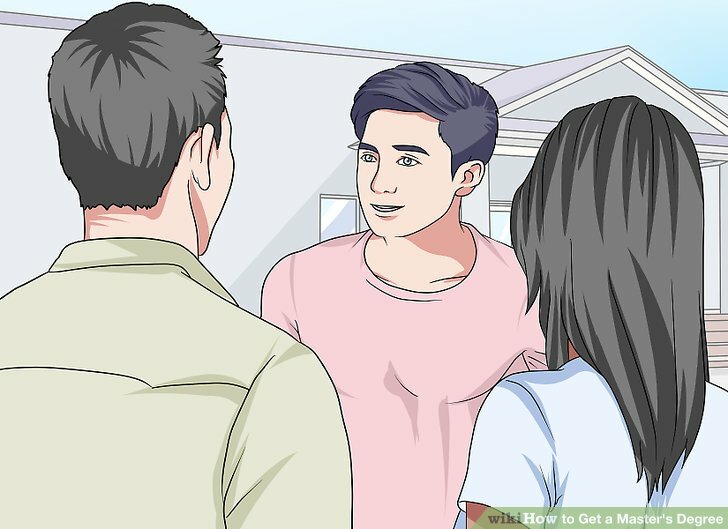 For example, you might decide that you'd like to go into a career in teaching and eventually become a high school principal. Alternatively, you may want to open your own business and want to improve your credentials to make your enterprise more desirable to investors. 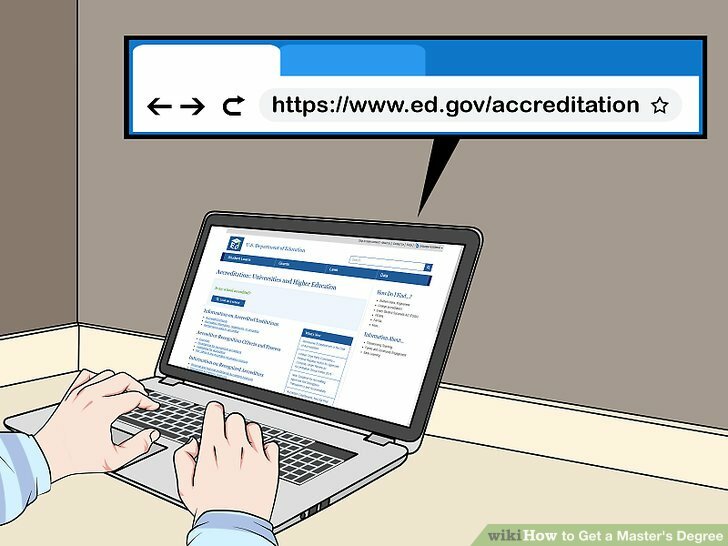 Keep in mind that if you need a state certification to work in a specific area, you should attend a school that will provide you with the appropriate certification. Talking to a career counselor at your school or a local university might help you decide which degree is right for you. It’s also helpful to talk to a mentor who has the career you want. Ask them about their educational background and what is currently expected in the field. Check the prerequisites for the program you want to attend. All master’s degree programs will require you to first earn a bachelor’s degree. 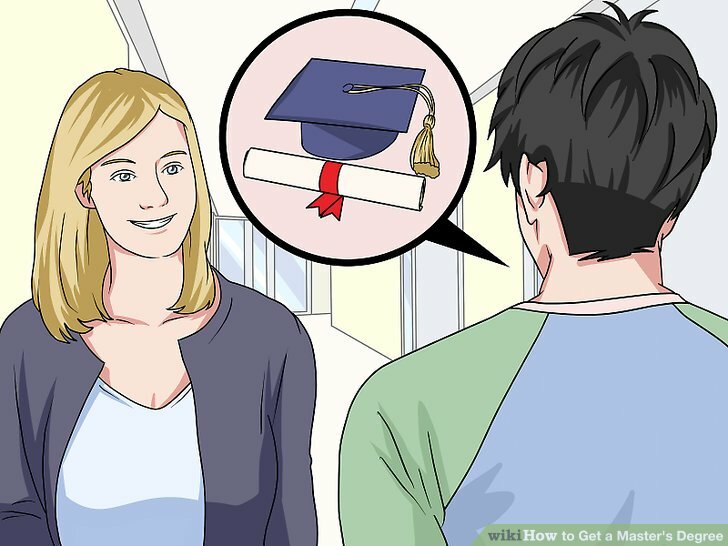 Some master’s degree programs do not require you to have a bachelor’s degree in the same subject, but other programs will. 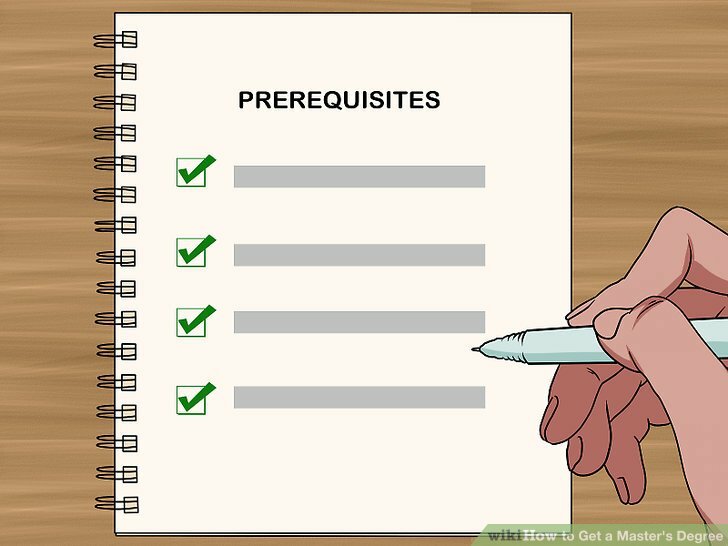 Check each program for its required prerequisites, as they can vary. Programs in the liberal arts and humanities are more likely to allow you to work toward a master’s degree with any bachelor’s degree. Typically, programs in math, science, computer science, engineering, and healthcare require you to have a bachelor’s degree in the same or a similar field as the master’s degree you are seeking. 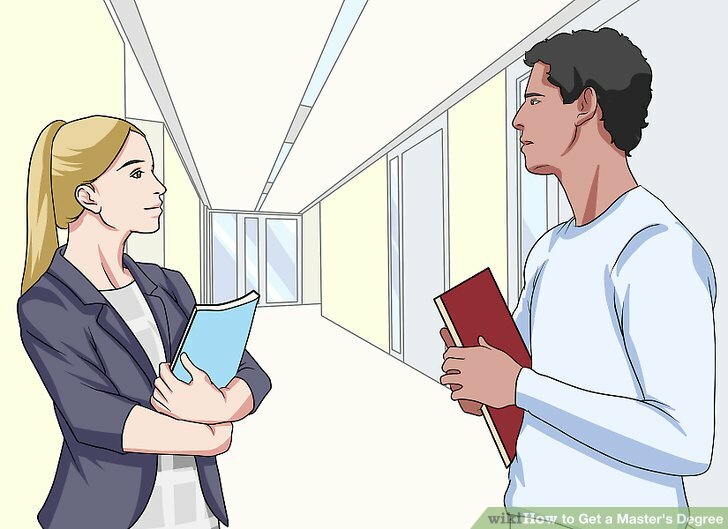 If you don’t have a degree in the same subject, your school may allow you take make-up credits while you earn your master’s degree. The Graduate Record Examination (GRE) is commonly required for admission to most graduate programs. 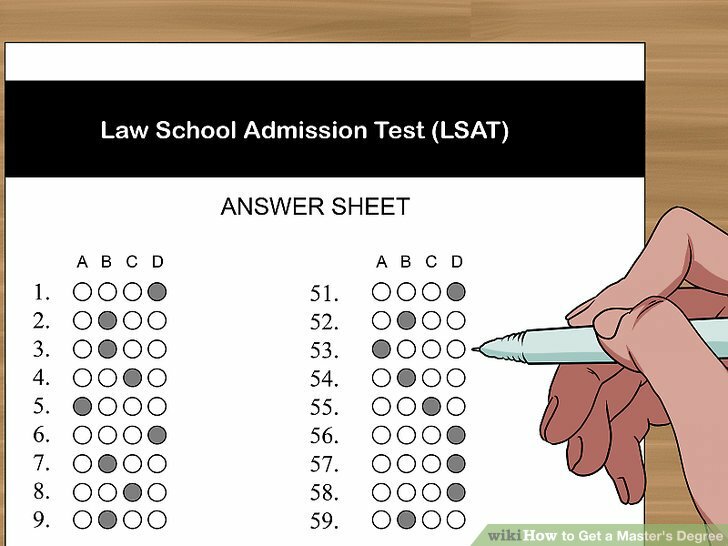 The Law School Admission Test (LSAT) is required for admission to law school. The Graduate Management Admission Test (GMAT) is a requirement for admission into MBA programs. The Medical College Admission Test (MCAT) is necessary for admission to medical programs. Consider if you want to attend an online, in-person, or hybrid program. Online programs allow you to attend classes with your preferred college or university from anywhere. In-person classes allow you to attend seminars alongside your cohorts and participate in class discussions. Hybrid programs offer a mix between online and in-person classes. Online classes might be best for you if you’re currently working or need something you can fit around your schedule. However, some online classes, such as those that require labs, may require you to complete part of the coursework in person. In-person classes might help you if you learn better in a typical classroom environment. A hybrid program might work well for you if you’d like to attend a program in-person but enjoy the flexibility of attending online. Talk to the professors and students at the school you want to attend. Ask the professors about their research and their specialties to make sure they’re a right fit for your goals. Similarly, talk to other students to find out how well they like attending the program and if they feel their needs are met. Consider how you will fit in with the students and faculty. You will likely assist professors in their research, so it’s important to know what their research is about. Get to know the culture of the program before you commit to attending that school. You can do this by attending any presentations or meetings that the school offers to prospective graduate students. This will give you the opportunity to meet the faculty, learn more about the program, and explore the space you would be learning in. Check the deadline and required materials. Make sure you submit your materials by the due date. It’s important to know what you need to submit, since it may take time for you to gather all of your materials. 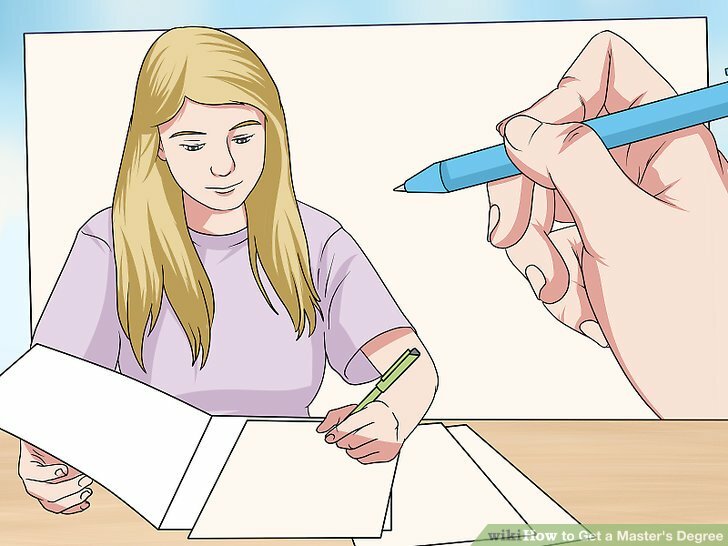 Start preparing your materials at least 2 months before the deadline so you have time to collect letters of recommendation and write your statement of purpose. It’s common for graduate programs to require writing samples or work you’ve previously completed. 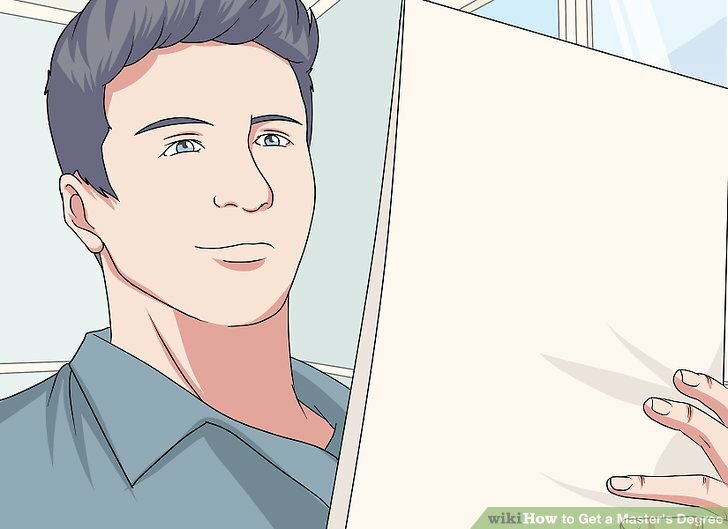 Select the best examples of your work from prior classes you’ve taken. As another option, you can prepare a writing sample or project for your application. If you decide to create a new sample of your work for the application, choose a topic that you plan to pursue in graduate school to show the school what you will bring to their program. If it's possible, incorporate research from the professors who work in the program you're hoping to attend to show them you'll be a good fit. Complete your application online and pay the fee. Fill in every blank on the application honestly. 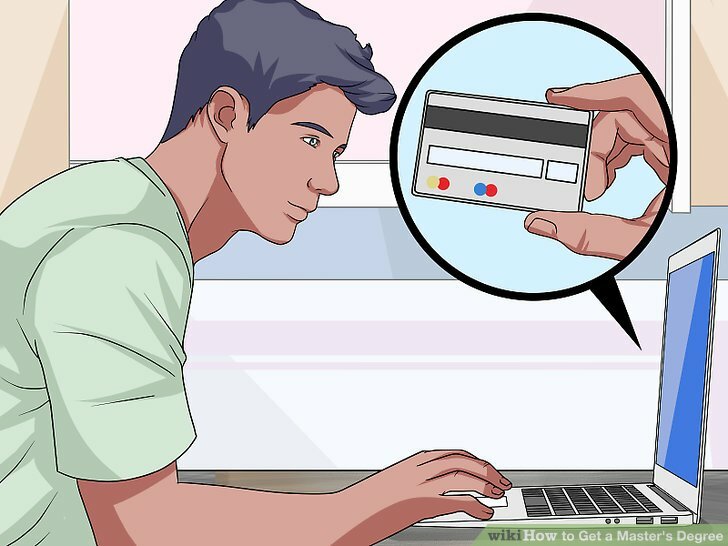 Then, submit your payment online. For example, you may need to pay a $50 application fee. Each university will outline its own fee schedule. If you have any questions, contact the school’s graduate admissions office for assistance. Upload your resume or curriculum vitae (CV). 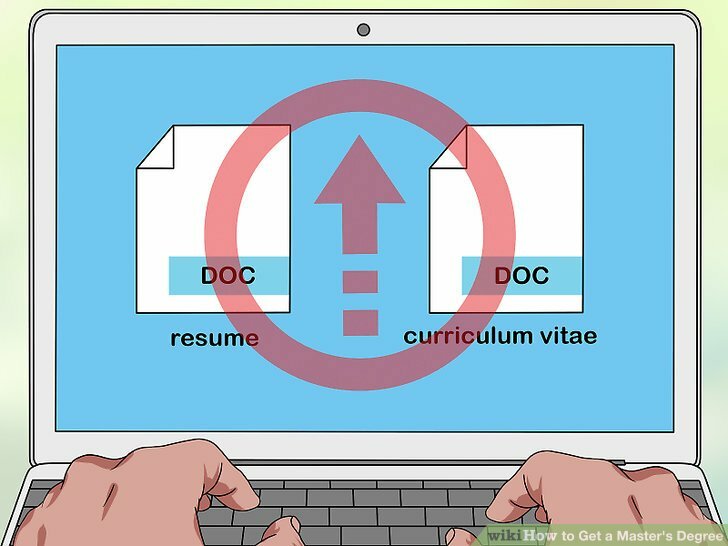 Both a resume and CV include your educational and work background with the purpose of showing why you’re qualified for the program. Highlight the courses you’ve taken in the past, any related work experience you have, as well as any special s****s you have to offer. Your goal is to show them you’re an excellent fit for their program and will be an asset to their team. Write your statement of purpose to explain your goals. Your statement of purpose explains what you hope to achieve through your studies. Tell the admissions department why you want to pursue your master’s degree, what you will bring to their program, and why you’re a great fit. Discuss your professional goals and why you think you have what it takes to succeed. Make sure to proofread your essay. If you can, have a friend or classmate proofread it, as well. 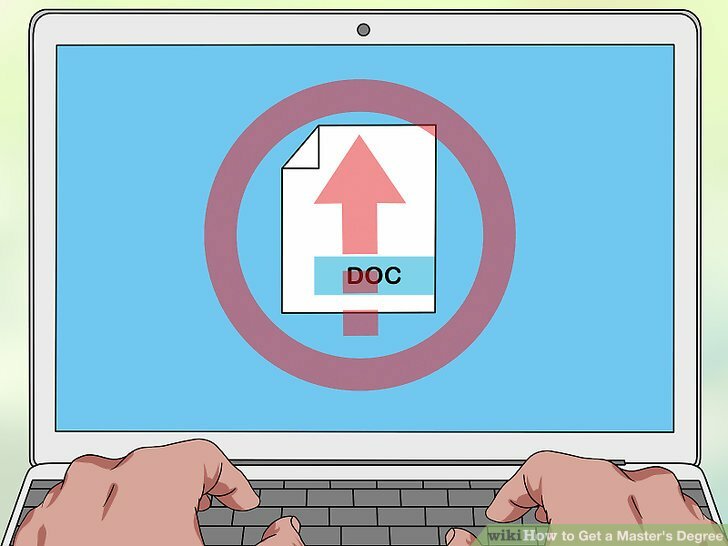 Check the school’s requirements for the essay before you submit it. Submit 2-3 letters of recommendation from prior professors. You may need to upload or mail in the letters yourself. 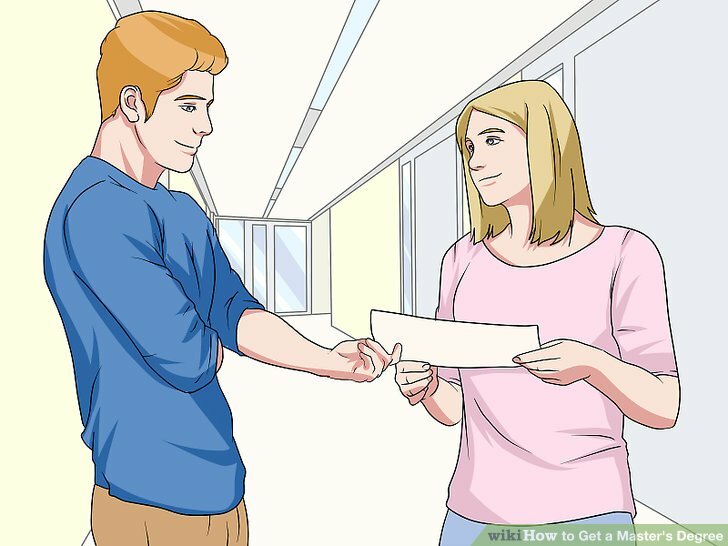 However, some programs require you to have your professor email or upload the letter themselves. Check the requirements for your individual program. Make sure your professor has at least 5-6 weeks to write your letter. 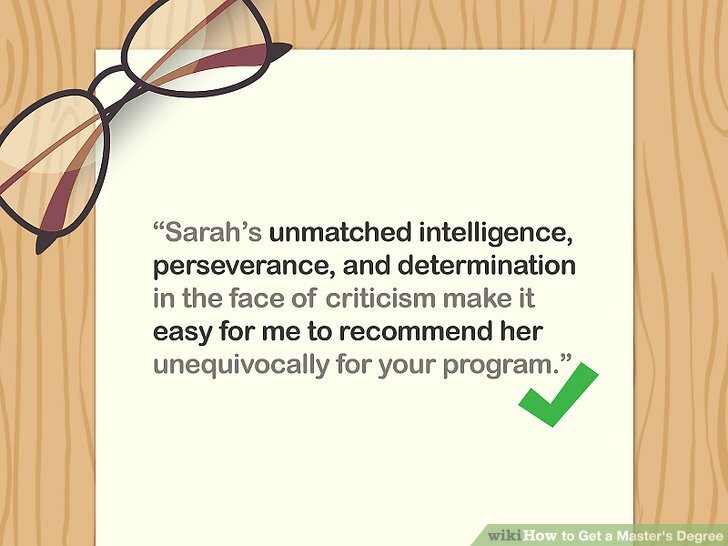 Your program’s admissions requirements will tell you how many letters of recommendation you need to submit. In most cases, the letters will be confidential, so don’t ask your professor to let you read it. Send in your transcripts for your prior degrees. Contact the Registrar’s Office at the college or university where you earned your bachelor’s degree to order your official transcripts. You may be able to order them either in-person or online, depending on your university. 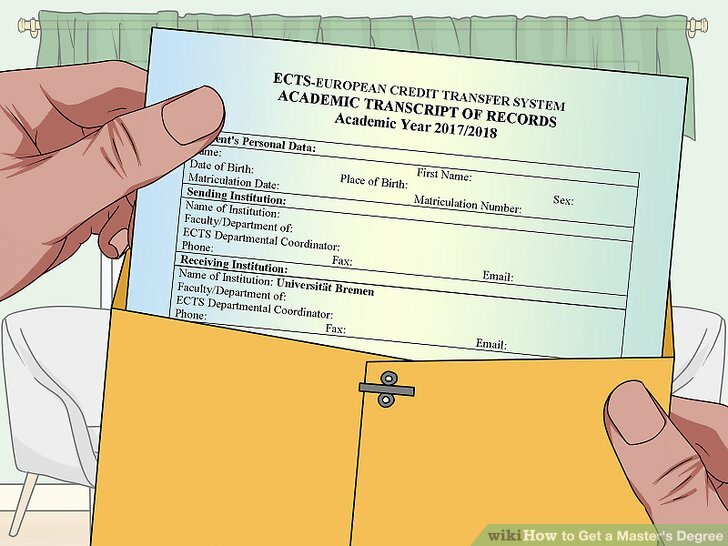 You’ll need to pay a fee before the transcripts will be sent to your university. It typically costs about $5 per transcript. However, it may cost more depending on when and how you want them delivered. Some colleges and universities contract with services who manage and send your transcripts online. You can find out if your university uses one of these services by checking online or by contacting the Registrar’s Office. Upload examples of your writing and work, if required by your program. 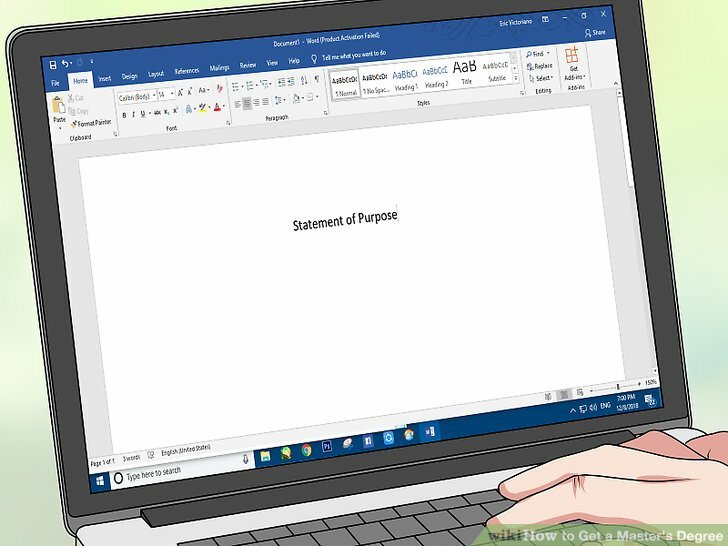 Examples of your work might include papers you’ve written, research projects you’ve completed, plans you’ve helped develop, or strategies you’ve created. Check the admissions requirements for the program you want to attend to find out what type of work they expect you to send. Choose your best work to showcase your knowledge and s****s. You may even want to polish your old assignments to incorporate feedback from your professor during the grading process. Check for stipends for apprenticeships or research help. Many graduate programs offer stipends to help students cover the cost of tuition and books. These stipends may require you to work as an apprentice to a professor, provide research assistance, or teach undergraduate classes or labs. You can also ask about other work-study opportunities at your school. For example, you may be able to earn tuition help by working at the campus library, tutoring undergraduate students, or doing administrative work. In some cases, your stipend may cover the full cost of your degree. However, they usually cover just part of the cost. Some programs offer stipends to online students, but you're more likely to receive a stipend for an apprenticeship or research assistance if you attend the program in-person or as part of a hybrid program. Apply for scholarships to lower your costs. Most graduate programs offer their own scholarships, so you’ll need to apply with your program. You can also apply for scholarships through private foundations. Your school can provide you a list of available scholarships. You might also search online for opportunities. Talk to a graduate admissions official at the school you plan to attend to find out about available scholarships. Talk to your employer about tuition assistance. Many employers offer money for continuing education, especially if you can use your new s****s to grow their business. Ask your boss or human resources department about the options available to you. Your employer might pay for classes or reimburse your expenses. In some cases, your employer may pay for your entire degree if you plan to continue working for the company. However, they're more likely to pay for 1 or 2 classes a semester. If you’re looking for a job, consider tuition reimbursement when comparing benefits packages. Get a student loan as a last resort. A student loan may be your only option for paying for your degree. 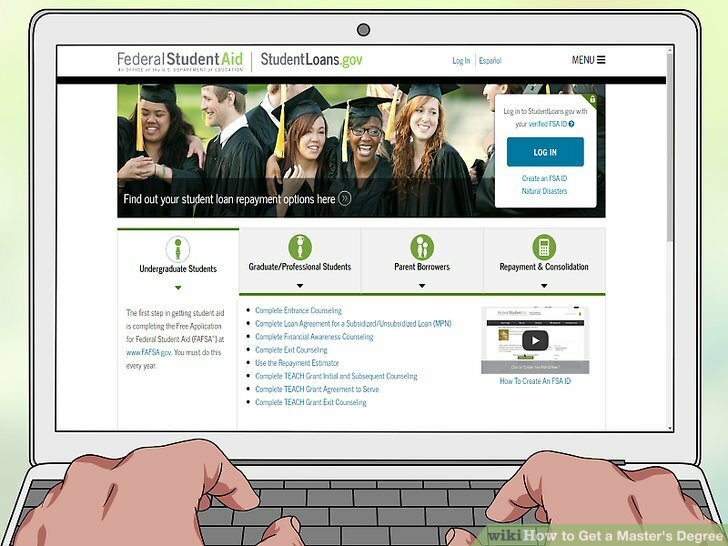 You can apply for a federal student loan after you complete your FAFSA. 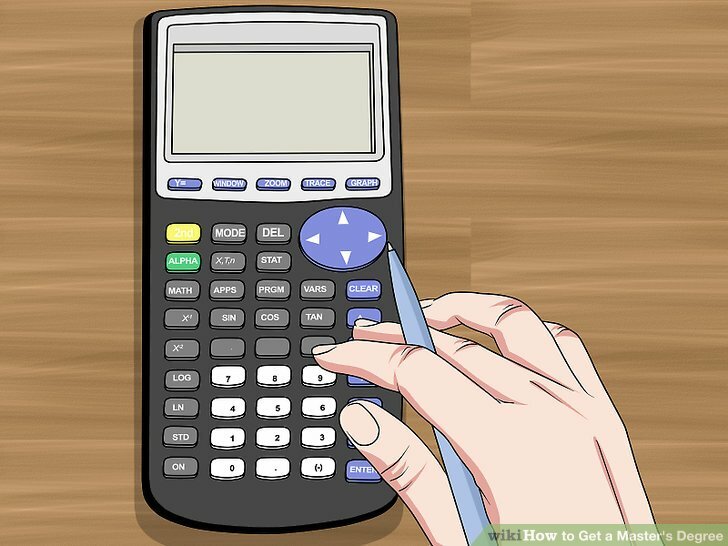 Take out as little as possible to cover your expenses, as you’ll need to pay back your loan after graduation. Graduate students are typically able to borrow more in student loans than undergraduate students. Private student loans are also available if you still need assistance covering the costs of your program. You can apply for a loan online through your preferred lender. Create a schedule for studying, completing assignments, and attending class. Falling behind can quickly lead to failure in grad school, so managing your time is important. 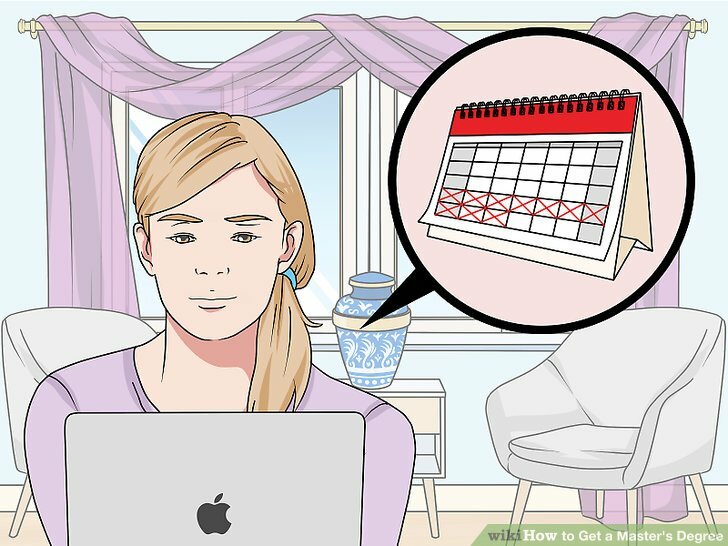 Write assignment due dates and test dates in your planner as soon as you receive them, and write in mini milestone due dates to keep you on track. Schedule your reading and study time during the time of day when you’re most alert. Break big assignments, such as research projects, down into smaller milestone projects. 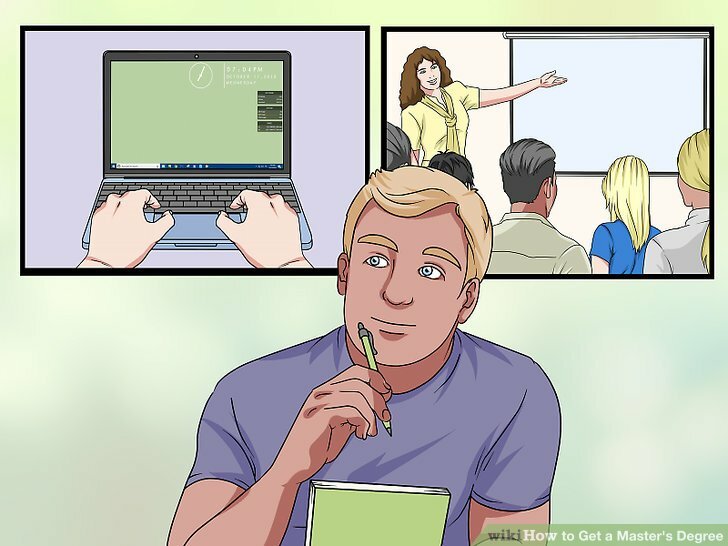 For example, your first 4 mini milestones for a research project might include "get topic approval," "do literature survey," "write proposal," and "book lab time." Create self-imposed deadlines for yourself so you can stay on track with big projects. Organize your coursework and materials. Keep a folder or binder for each class, and hold onto all of your coursework for each class. If you're keeping your documents electronically, you can upload them to the cloud or keep them all on Google Drive. As another option, keep a flash drive on your key chain so your files are in easy reach. Not only will this help you study, you can also build off of your old work as you continue to do research. Being organized will ensure that you always have what you need for class. Keep your notes organized in a notebook or binder to make studying easy. Keep up with your coursework. Graduate level classes are more in-depth and demanding than undergraduate classes. Every reading, lecture, and assignment is important, so do your work. Set aside time every day to read and study so you don’t get behind. Talk to your family or roommates to let them know how important your study time is so they don’t interrupt you. 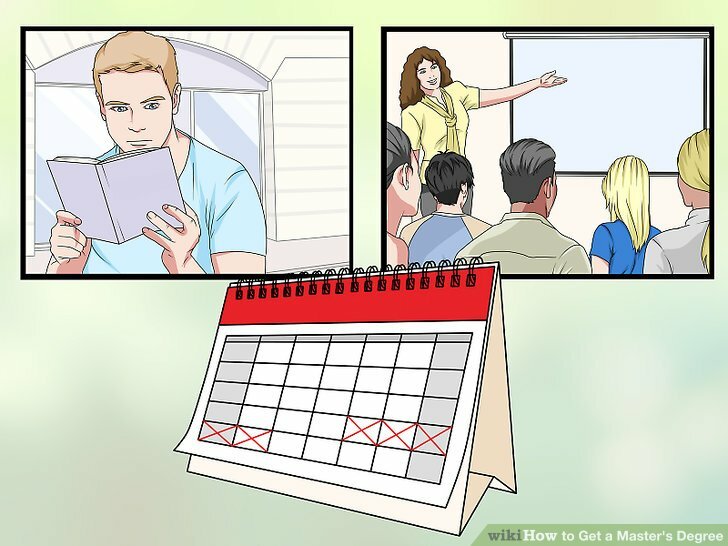 Look for pockets of time you can dedicate to your studies, such as your lunch hour, the hour after dinner, or the hour between when you put your children to bed and when you go to bed. If you’re struggling to complete your assignments, talk to your professor, a classmate, or your school’s tutoring center. They can help you better understand the material and get caught up. Reach out to your professors for guidance and feedback. Build a reciprocal relationship with your professors. Just as you will help them with their research or publications, they’ll give your valuable insights and direction. Use their feedback to improve yourself. You will need to take a more active role in your education when you’re pursuing a master’s degree. 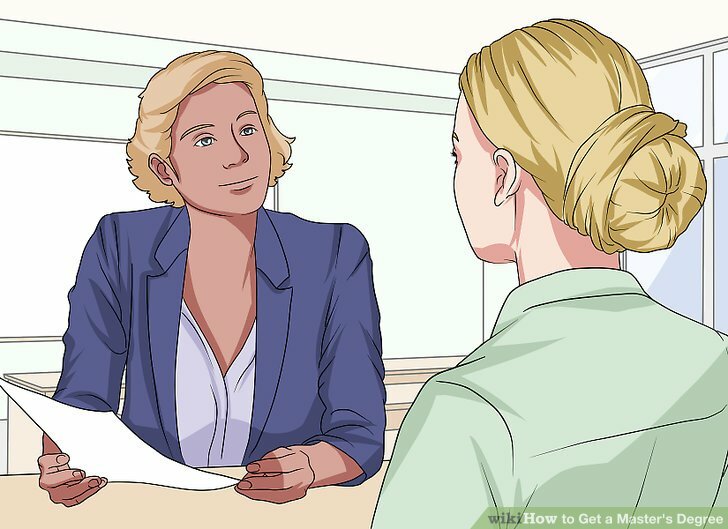 While you’ll have the opportunity to work more closely with your professors, they’re going to expect you to show initiative and come to them. Create a support network to help you cope with obstacles. Graduate school can quickly become overwhelming, but you don’t have to do it alone. You can create a support network out of your program advisor, classmates, family, and friends. Ask people to be there for you before things get rough. That way, you’re prepared for any obstacles that arise. Life is going to keep going while you’re earning your master’s degree. Your support network can help you balance your responsibilities and take care of yourself. Graduate programs involve more independent study than an undergraduate degree program. Because graduate programs are so demanding, it’s best to only work part-time or on campus while you’re completing your master’s degree. Graduate programs have a much greater workload than undergraduate programs. Expect to read, conduct research, and write often.